Blessed by kaunas, 'aloha aku' means the place that ‘gives love and kindness’. Formally known as Aikane Hale. Aloha Aku Inn & Suites is a tucked away, one-of-a-kind vacation gem. Our luxury Beachfront private estate has 4 beachfront one-bedroom suites and a garden view two-bedroom ohana. Each suite has a private entrance, separate living room, full kitchen and is like having your own condo at the beach in Maui. This special place is hidden behind a private, double gated entrance, lined with 700 ft. of lighted coconut palms that lure you into the feeling of leaving the world behind. 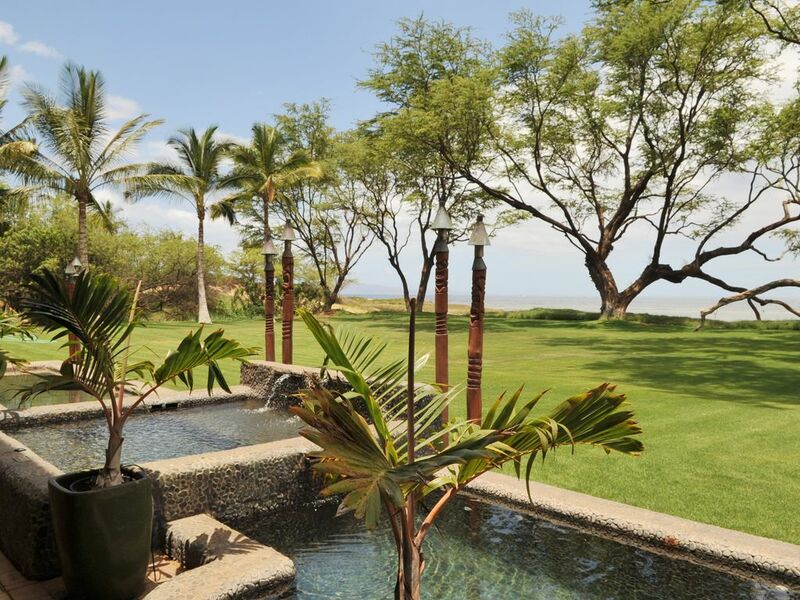 But is still centrally placed in Kihei nearly all of the amenities you might desire. Guests have described Aloha Aku as ‘the most tranquil and ultimate place for relaxation!' You can’t help but feel the peacefulness of Maui's beauty wash over you here. The beach out front of Aloha Aku is only accessible from Aloha Aku or the private neighboring homes and condos. As a result, the beach is underused and hardly traveled; sometimes it’s like having your own private beach. Hidden behind the tallest mangrove forest in the state, Aloha Aku will pleasantly greet you with an extravaganza of natural Hawaiian beauty. Aloha Aku lulls you into a wondrous state of being, yet is in the ultimate location for access to the many conveniences in mid-Kihei. Aloha Aku is well situated to be your base of operations to explore the rest of the Maui island, just twenty minutes from the airport and are within easy walking distance of nearby groceries, shopping, pupu bars (appetizers), dozens of eateries, bars, car rentals, dive shops, and much more. When guests return to the property they say it ‘feels like home’. Some never leave the property during their visit, happy to just lounge around and suntan from their private lanai or on the beach out front! Your hosts, Charlene (Maui-girl) and Gary (G-kane) - (pronounced ka-nay), have upgraded all the Suites to include air conditioning, ceiling fans, free high speed Wi-Fi, free designated on property parking, key codes for everything (no keys or cards to worry about), flat screen HD TV's with DirecTV in the living room and in the separate bedrooms. Warm up a snack or make yourself a full meal in your Suite's fully equipped kitchen. Take a cool dip in the ili-ili (smooth) stone dipping pools or take an invigorating Jacuzzi while watching the stunning sunsets. In addition, there is a gas barbecue on site nestled between some acacia palm trees overlooking the State protected La'ie wetlands. We were coming home and we just found this magical location and opportunity. We are happy to be able to get it and to be able to open it up to others. Great views, great beach, great location, and oh yes, just great. Just ask. We are here to help make your experience the most that it can be. I can’t say enough about this property and our experience both times we’ve stayed. On each visit there have been special touches to the room to really make you feel welcome and give that “home away from home” feeling. It’s clean, private and has all the amenities you could need. We stayed in the 2 bedroom casita which is very spacious and included towels, beach towels, coolers, soap and all the kitchen supplies. The fridge included some morning treats that went great with the included coffee. While this casita doesn’t have an ocean view it is supplemented with beautiful lush landscaping and your own private patio with table and lounge chairs. The beach is not far at all. In the common area you will find beach supplies, chairs and umbrellas. I forgot water shoes and was able to borrow some. They make it so easy! The staff is super friendly. We loved ending the day with the sunset in the jacuzzi. Kihei is a great location on the island. I would highly recommend staying here. I can’t imagine a better place. Thank you for everything and we can’t wait to return. We are hoping as a family to return again next year...!! We so enjoyed having you as our guests. Glad you had a fantastic experience. Big Mahalo for the five stars! Looking forward to your return next year. We had a very nice stay in the Ohana Suite of this property. The property is right on a quiet beach with a beautiful view of the water and sunset. Walking distance to some great restaurants (Nalu's, Coconuts). The birds in the morning were amazing to listen to. Our children had a great time in the hot tub, pool, and beaches. Only complaint would be the not entirely private bathroom experience in the rooms. Big Mahalo for the review! It's important in the tropics to have airflow in bathrooms to prevent mold. It's very common to have the bathrooms designed this way on Maui, so sorry if that impacted your experience. Glad you and your family had a great time staying with us. Hope to see you again soon. The suite we stayed in was perfect for Thanksgiving, as it was large and had plenty of room for hosting. It is right by the beach and the large grassy back was excellent for hanging out. The kitchen could have been a little better equipped with more plates, glasses and silverware. Happy to hear you had a wonderful Thanksgiving! We have extra kitchen ware in our common area for when you host a dinner. Visit again soon. Aloha! After looking at the pictures and descriptions of Aloha Aku we were pretty sure that we would have a good experience. After spending a week there it's hard to find adequate words to express how delighted we were! Char and Gary run this charming cross between a B&B and a beach cottage with so many thoughtful details and surprises. I know not everyone is celebrating a special day but we were - our 30th wedding anniversary - and when we entered our room there was a lovely card and a gift basket! The feel of the place is what seems like "old Hawaii" - like you stepped back in time (not old like run down - Char and Gary spent two years renovating the inn). The result is a very relaxed environment where it is easy to unwind - one sees very little nearby development, due in part to the adjacent wetlands (an unadvertised treat is the morning parade of ducks when the maintenance guy comes to feed them in the morning!) This is in stark contrast to some resorts that all seem to come out of the same box (not that there's anything wrong with that if that's what you're looking for). In summary, Aloha Aku is an amazing place in an amazing place. You'll probably have to book well in advance of your stay as it is a small property - part of its charm - we hope to be able to return some day. Mahalo Kathy! We are incredibly happy that you enjoyed your time here, and we hope that you had a fantastic anniversary! Aloha! Would stay here again without hesitation. Char & Gary have a beautiful, immaculately maintained, cozy & comfortable, quiet, right-on-the-beach property. They provide paddle boards, kayaks, bicycles, beach chair & umbrellas for guest use. The common area has a well stocked frig & pantry with lots of supplies & goodies so you don't have to buy them. Her banana bread is delicious by the way and there are always small loaves in the frig to enjoy. Within a 5-10 minute walk you'll find the grocery store, lots of restaurants and shops, a 24 hr Long's Drug, a dive shop, Kihei Post Office, ACE Hardware and the list goes on. You can walk the beach in either direction from AlohaAKU. The spa is unique-it's got a neat waterfall feature that circulates the hot water into the spa then it goes into 2 long wading pools on either side of it. If you need indoor workout there's a rowing machine/stationary bicycle. Access to a computer/printer, a nice library of books for reading. All in all an outstanding place to stay!! Located in Central Kihei and within walking distance of most everything you might want or need. Tucked away at the end of a 700 foot long drive and right on the beach.